This story has taken some time to write. It all happened six months ago but its still painful to think about and look at photos. Chi and her daughter Changi came into rescue in February 2014. She'd had Changi when she was really too young to have kittens and had struggled giving birth. Nevertheless, the family she lived with hadn't bothered to get her spayed after she'd had the kits. When asked about whether Chi (or for that matter Changi) might be pregnant, the family responded angrily "NO" - she only went outside to go to the toilet and they couldn't keep her in when they had children around. A little nervous at first, the pair showed themselves to be lovely friendly cats who still got along well together, and we set about getting them ready to go to a new home. They both had quite bad ear mites so we began treating them. 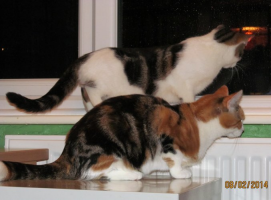 A lovely family contacted us saying their friends had adopted from us and did we have other cats available for adoption. 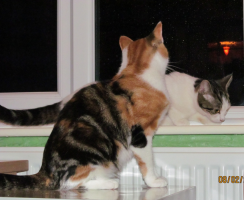 They came and met Chi and Changi, fell in love with them and offered them a home together. We took them to the vets for their vaccinations, and our fears were confirmed, Changi had her vaccs but Chi couldn't have hers because she was pregnant. The family said that's fine, Changi can come to us now and Chi join her after she's had her kittens. We couldn't have hoped for better - at last a wonderful loving home for the pair of them. Changi went off happily to start her new life. Chi and I snuggled each day, watching the kits moving around in her tummy and talking about what we might call them once they were born. She'd come and lay close to me and I'd tell her not to worry, I'd look after her, she and her kits would be fine, and once they were old enough she could go off to her new life with Changi and her new family. Then one evening I came home from work, went into Chi's room. 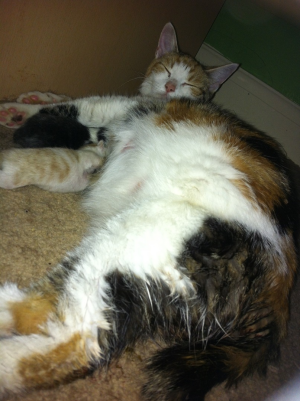 She ran to greet me, her tummy still big with kittens, purring away. I stroked her and fed her and made a comment about her not having had her babies yet and went to leave the room to feed the other cats. 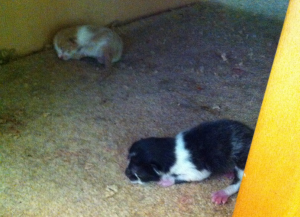 It was then I heard some squeaking, and discovered two tiny kittens under the desk. Chi showing no interest in them. This seemed a little odd since new mums are usually very attentive. Then I saw Chi had a huge blood balloon hanging from her rear end. She continued making a fuss of me as though nothing had happened. I phoned the vet in panic and they said to wait about 20 minutes to see if things progressed and then phone back. The balloon burst to be replaced by another. I persuaded her to give her kits a cuddle for a while. The birth however was stuck and a second phone call to the vets ended in one of the worst drives in my life. Teatime rush hour through one of the busiest areas of Sheffield. Chi screaming with pain of stuck labour and trampling on the tiny vulnerable new born kits. That image will stay in my mind forever and return always at a certain set of traffic lights. The vet examined Chi and thought that the next kit in the birth canal was dead and that had caused a blockage. He and his colleague did an emergency C section whilst I waited in Tesco's cafe down the road. I returned to find that one kit had indeed died, and another two had been born by section but struggling to warm up and kick into life. Chi was ok, but not coming round from the op as well as they'd hoped. Ages later after the surgery was officially closed, I was still struggling to warm up the kittens whilst the staff worked on getting Chi awake again. When we couldn't manage it, they all went home with the vet nurse. We're frequent flyers at our vet surgery and they're very kind and sympathetic to our rescue so they gave us a discount on the operation. The full bill would have been just shy of £700! The following morning we'd prepared for possible bad news. Maybe one of the kits hadn't made it through the night. Maybe more than one of them hadn't survived. 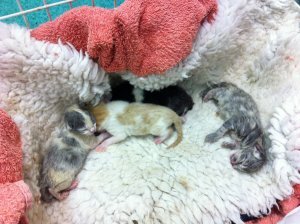 What we weren't ready to hear was that all four kits were still with us, but mum had come round from her op, started walking around, but then collapsed and died very suddenly. Had there been time to grieve I'd have broken my heart over her, but there was a full day of work ahead, and straight from work to the vets to pick up four tiny kittens with no mother to care for them. 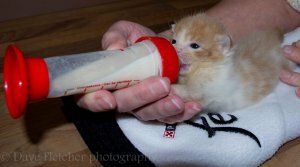 There's some sweet images of kittens with feeding bottles. What is less often portrayed is the nightmare of sleepless nights, two hourly feeds and endless worry about such fragile tiny things. It was like the painting of the Forth Bridge - by the time they'd all been fed, toileted, cleaned, dried, put to bed, new formula made up, bedding washed, it was time to start again. The weakest of the ones born by C section refused to feed after the first day and died soon after. The other little C section boy was the biggest and seemed the strongest of the group but unexpectedly and inexplicably died between feeds. There's a little joy in this story. 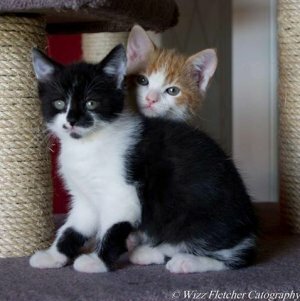 The two kits who were born before the nightmare started have grown into happy healthy kits and are now neutered, in a new home and happy little things. However, before you can't be bothered, or think you can't afford to have your cat neutered, remember that three tiny kittens and one adult cat died in this story. Caring for them cost over a thousand pounds (without vet discount): Chi's surgery plus care and special nutrition for the kittens. It also cost a lot of hours of sleep and a huge amount of heart ache. For the memory of Chi's sake, please neuter your kittens.